Lambics are probably the most widely known and iconic of the sour/funky beers. Spontaneously fermented by microbes that live in the Belgian air and in the wood of the brewery, and then aged for years before consumption, they are to funk what the Double IPA is to hops. In many ways it is the most unique style to brew, with nearly ever step diverging from standard modern brewing procedures. I certainly didn't follow the traditional methods as closely as some people do, but I made an attempt to at least carry on the spirit of each step. The traditional grist is composed of approximately 70% pilsener malt and 30% raw wheat. I used flaked raw wheat because that is what the local homebrew store had, and I added a bit of Munich malt for some added maltiness because my shorter mash and boil would not develop the same level of melanoidins the traditional method would have. Traditionally a turbid mash is used which includes up to ten steps that aim to preserve a complex blend of dextrins and starches which the various strains of yeast and bacteria will feed on during the long fermentation. I did a simpler procedure, called the Wyeast Mash from Wild Brews, which is a variant on a cereal mash, boiling all the wheat with 10% of the barley before adding the remainder of the malt and stabilizing at a high saccharification temperature of 158. In either method the sparge water is extremely hot to aid in the extraction (tannins and other unpleasant molecules which are extracted and would normally result in an unpleasant beer are either consumed by the microbes or fall out of solution during maturation). Traditionally the long hot sparge results in such a dilute wort that a 3-4 hour long boil is needed to condense it to around 1.050. In my case I did not have the pot size or heat source required for such a long boil, so I collected 7 gallons and boiled for 2 hours. My original gravity was over 1.070 (with an amazing 90% efficiency), but I had to top off with boiled and chilled water a couple times to account for blowoff, evaporation, and sampling, so my effective OG is about 1.058. Traditionally huge amounts (~1 oz per gallon) of aged hops are boiled with the wort. As hops age they loose the alpha acids that isomerize to give beer its bitterness, but their preservative power is saved. This preservative power allows them to fight off the more aggressive microbes that would make the beer harshly acidic or funky. I agree that this is a necessary part of the brewing process if you are spontaneously fermenting, but I don't see the point in an inoculated lambic like the one I brewed. 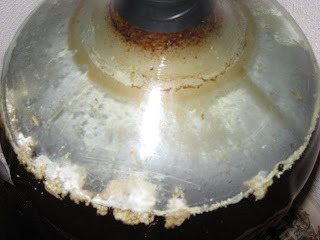 When you are boiling the wort, quickly chilling, and then adding the microbes of your choice, it doesn't seem like there is any more chance of unpleasant "infection" than in any other sour beer (most of which do not use copious amounts of aged hops). Unlike every other style lambics spend years in the same primary fermenter. The Brettanomyces uses the autolysing (rupturing) Saccharomyces cells for nutrition during the prolonged souring period. Traditionally the fermenter is a used oak barrel that has had most of the flavor stripped out of it already. The oxygen that slowly diffuses in through the wood aids some of their microbes as they slowly work. 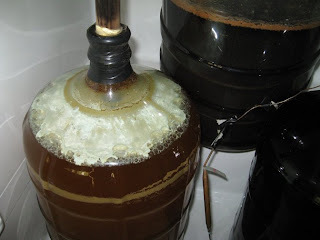 To mimic this I used a toasted oak peg stuck through the neck of the carboy, I found several problems with this method as I discussed in the past. After the blender deems a batch of lambic to be complete, it is either blended with younger and/or older batches to make a gueuze, bottled alone to be an unblended lambic, or aged with fruit for months to make a fruit lambic (Cherries - Kriek, and Raspberries -Framboise being the two most popular). I started my my first attempt at the style nearly two years ago, and it is still sitting in primary. The top photo is what it looked like in December 2006 with a nice thick pellicle, and the bottom photo is from April 2008 with the pellicle beginning to reform after it was damaged. I am planning on priming and bottling half the batch this summer and aging the rest on blueberries. I figure what better way to draw a distinction between it and the traditional Belgian examples than to use a traditionally American fruit (apologies to Cantillon Blåbær Lambik). 1.50 oz. Czech Saaz @ 115 min. 2 year old hops 3.3 AA listed, adjusted down to 2.5 AA, left open to the summer air for 1 month prior to brewing. Boiled down to 4.5 gallons to allow for primary in a 5 gallon carboy, intended to do a longer boil, but got better evaporation than expected. OG 1.072 (pretty high, but it will get topped up with water) Cooled to 70 degrees, strained out hops, hit with 20 seconds pure O2 and pitched a room temperature smack-pack of Wyeast lambic blend. Put into fridge at 65 degrees. No activity the next morning. 9/4/06 Gave it a shake to get the yeast moving, it worked with a thin krausen soon rising. 9/6/06 It stinks (sulfur), the brownish krausen is still at only a half inch or so and the temp strip reads 69 degrees. 9/10/06 Krausen completely fallen, so I topped up with about a gallon of boiled and chilled water.Topped with oak chair leg, toasted and soaked/boiled, then used to top carboy after primary hopefully this will transfer oxygen into carboy, let co2 out give the Brett a place to live and impart a small amount of flavor. Fridge left at 65 for extended maturation, lots of CO2 still being released, visible bubbles and audible hissing noise. 12/24/06 Looking good, except some more of the beer escaped through the wooden peg. Nice funky krausen going on in the carboy, the trub at the bottom appears to be smaller than before. 8/12/07 Took out the wooden peg to get a sample. It was so hard to remove that I decided to just go with an airlock for the rest of maturation. The flavor is still not very sour, but it is certainly funky. 12/25/07 Moved from the cool closet off the garage to the closet in my old bedroom. This broke up the remnants of the pellicle. 4/12/08 A new thin pellicle seems to be slowly forming. My plan is to bottle half this summer, and age the other half on some blueberries. "The beer has actually been made two times, first in August 2005 where 25kg blueberries were send to the brewery for the making of 110 litres of blueberry lambic. Unfortunately the berries were in the barrel for too long making half of the batch go sour (!). Only the part of the beer that wasn't in direct contact with the berries turned out good, leaving only 50 bottles..!! Too few to put on the market. So in December 2006 Jeppe and his wife drove to Belgium with 50kg of blueberries for the making of the second batch (this time 225 litres!) The beer fermented for approx. 1½ month before getting bottled in January." The volume to weight quoted translates to 4.66 lbs for my 2.5 gallons. I am hoping to put the beer onto blueberries July 18th, and bottle around a month later. 7/18/08 Blended the beer 4:1 with my 1 year old Flanders Pale ale to help cut the strong acidity. Then bottled half of it with 3/4 cup of light DME. I didn't add any extra yeast as the younger beer should have enough viable cells to carbonate the beer. The other half of the batch was racked onto 4.4 lbs of local blueberries that I briefly froze to help break down the cell walls. 8/11/08 The blueberry half is delicious, but still too sweet at 1.010 to bottle. It should be ready to go by this winter. The plain bottles haven't carbonated yet, but I expected it to take awhile. 9/06/08 1st tasting of the plain half. 12/26/08 Bottled the blueberry portion with 1/2 cup of table sugar and some 71B-1122 (wine yeast), looking for spritzy carbonation. 6/16/09 1st tasting of the blueberry half. Very interesting. Of all of the homebrewed lambics I've tried, none of them have had that huge sourness that I come to expect when drinking something like a Cantillon lambic. I'm curious as to how the sourness in yours develops. I have had one truly commercial quality homebrewed Lambic, it was from Dave and Becky Pyle. They won best of show (Homebrewer of the Year) for their Straight Lambic in the 2005 NHC. They have four used wine barrels in their garage with various vintages of their lambic. They apparently started with commercial pitches of the various bugs when they got started years back, but now just use whatever lives in the wood to do the job. I doubt mine will be as sour as Cantillon, even the Pyle's was closer to the softer acidity of a Drie Fonteinen. Cantillon does everything they can to make the acidity as aggressive as possible, no temperature control, a medieval barrel cleaner, and conditions and microbes that that go through a “sick” period. Interesting post. I've been doing homebrewed lambics for about five years now and have built up abpout 100 galons in various carboys. My recipe is 67% pils malt and 33% falked wheat. I do a step mash as opposed to a turbid mash. I also ferment in normal fermenters with straight ale yeast for 1-2 weeks before transfering to carboys at which time I pitch the bugs. I use a wide variety of bugs (generally a mix of White Labs and Wyeast and a mix if premade sour blends plus single strains of various brett, pedio and lacto). I've found that more variety in the base beers makes for better blends. Our typical blend is normally 25% 3-4 year old, 50% two year old and 25% 1 year old. You should start more now and blend them. It really is better than working with single carboys because you never know what you'll get. Last note (for now). I stick to rubber stoppers because they still allow enough oxygen in. If you get too much oxygen (from a lose top or sried out arilock) you often get a white fuzzy mold in addition to the pellicle. Not harmful, but kind of ugly. Some of your photos look like you may have some mold and a pellicle as well. I know people like to use wood stoppers but we ditched those ideas in favor of rubber stoppers years ago and have been very happy with the results. The whole "oxygen tansfer" and wood aging thing with homebrewed lambics is overblown. Stick to rubber stopeprs. You'll get more than enogh oxygen over the course of several years. Nice site. Thanks for sharing your info. Great stuff, thanks for commenting. Glad to hear a regular step mash has gotten you such good results, going that way will make my future batches easier. What sort of gravity is left after the initial Saccharomyces fermentation? I've never had luck getting enough sourness for my taste with a clean primary fermentation. I have moved to rubber stoppers and airlocks as well, the oak peg was too much of a hassle, the Flanders Pale is the last of my sour beers with a chair leg. I'm planning on doing another batch of Lambic this August, I'll figure out what I am going to do with my 2 year old batch based on how it tastes at that point. 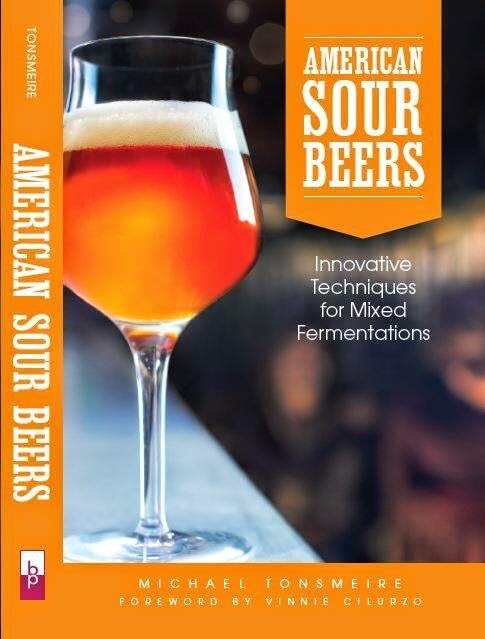 I'm actually a bigger fan of some other sour beer styles so I don't have the effort to brew Lambic as often as you. I may blend some of my 1 year old Flanders Pale (pils, wheat malt, carahell, 20 IBUs, Roeselare) into the 2 year old Lambic for some freshness and complexity. Those carboys live with my parent's so those pictures are all I've seen of them since December, I'm looking forward to seeing (and tasting) them for myself in a few weeks. The mold in the airlock was cleaned out, do you see anything that looks like mold anywhere else? Nice site, good info on the philosophy behind your blending, I'm looking forward to hearing how the batch changes. I brewed my first round of Lambics and 2 came out too sour to drink more than 12oz. Way more than Cantillon. I added 2 viles of Brett from East Coast yeast and used the yeast cake from my Berliner Weisse which was just lacto/saccro mix. My blueberry(my last one) came out damn perfect but using the same old yeast cake from the first ones. I only had it sitting on the bugs for 5 months before bottling. I added cherries to one, and apricots to another both very funky and tart but left on fruit for about 2 months each. The Blueberry one I added the fruit and bottled 2 weeks later. Would love to let you try and let me know what you think?? Sounds delicious. Always happy to try some homebrew, shoot me an email if you'd like to send me a few bottles for evaluation.